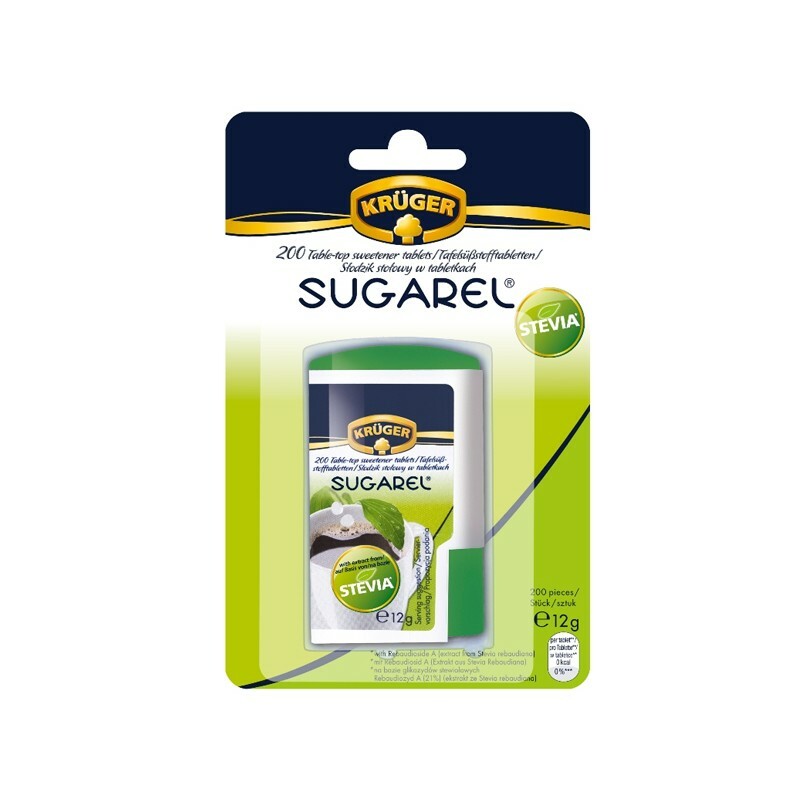 Sugarel Stevia table top sweetener in tablets, based on Steviol glycosides from Stevia Rebaudiana leaves extract is a perfect alternative to sugar and artificial sweeteners. It has a high content of sweetening compounds (Stevia leaves extract is 300 times more intense than white sugar) and contains no calories. Having a glycaemic index of 0, it does not influence your blood sugar levels, and is suitable also for those who have to follow a low-sugar diet. Use it to naturally sweeten coffee, tea, or any other hot or cold beverage. Although sweet, the product does not cause dental decay and rot. Make a revolution in your diet and naturally sweeten your food with Krüger Stevia Sugarel® table top sweetener in tablets that do not contain calories. For low-calorie sweetening of hot and cold beverages. Sodium hydrogen carbonate, acidity regulator: monosodium citrate, sweetener: Steviol glycoside *, L-leucine. Rebaudioside A (21%) - Stevia Rebaudiana extract (leaves).